A close reading reveals just how committed the federal Liberals are to solving the problem. 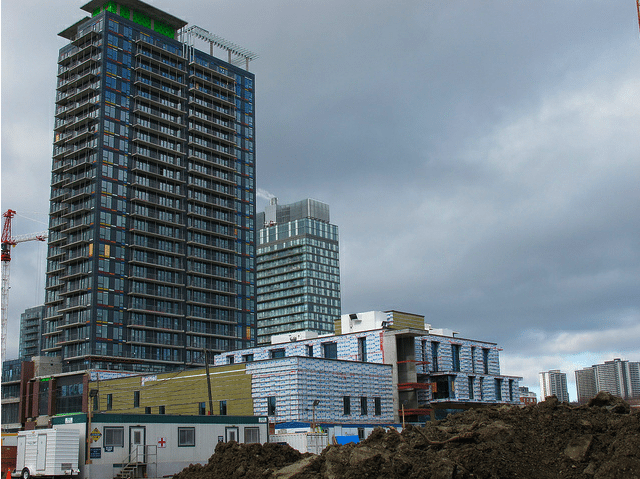 Regent Park construction, February 2012. Photo by Linda Edwards from the Torontoist Flickr Pool. With much fanfare, the federal Liberals last week rolled out a National Housing Strategy—long in the works, and the first of its kind, as they are happy to remind everyone whenever the chance presents itself. The party is touting some marquee announcements, such as nearly $16 billion in funding for repairing and building affordable housing, and the maintenance of current social housing stock; the creation of a “new Canada housing benefit” that will act as a rent supplement for people in social housing and the private rental market; and, perhaps most ambitiously, the promise to pass legislation designating housing a human right. As Families, Children and Social Development Minister Jean-Yves Duclos notes in the preamble to the strategy, 1.7 million Canadians are in housing need, and nearly 13 per cent of Canadian households, according to the Liberals, are in core housing need—spending more than half their income on housing. In the 1990s, the Chrétien Liberals divested themselves of affordable housing, moving it onto the provinces’ and territories’ plates while simultaneously cutting transfer payments to those governments, making it more difficult to finance their new responsibilities. The result has been the loss of public (government-owned) and social (operated by non-profits and co-ops, often subsidized by government) housing through attrition. Much of what remains is in dire need of repairs. What’s left today of social housing was facing imminent closure, as long-term operating agreements were set to expire. Until the release of this strategy, it was quite unclear how much, if any, social housing would exist in Canada by 2040. Over the past several years, as the real estate market heated, so too has the rental market. These dual processes have left renters facing a private market where they can’t afford the housing they need, and social housing that can’t accommodate them. With that in mind, is the current strategy up to the task of alleviating this pressing crisis? The answer seems to be: questionable. Yogi Acharya, spokesperson for the Ontario Coalition Against Poverty, says he is concerned that the strategy is little more than a continuation of what came before it. He acknowledged that the maintenance of social housing—by ensuring operating agreements can be renewed for another 10 years—is critical, but noted that Toronto Community Housing is one such provider. Even with operating agreements in place, the beleaguered and cash-starved housing agency is looking at closing an average of one unit each day next year because of long-neglected repairs. “Operating agreements continuing doesn’t guarantee the loss of social housing through attrition because things can’t be repaired fast enough and haven’t been for many, many years,” he said. The strategy does contain some funding mechanisms, via grants and loans, specifically for repairs and renovation, notes Jeff Morrison, executive director with the Canadian Housing and Renewal Association. Morrison considers it a victory that the federal government is engaging with affordable housing policy at all. He said, though, that key details remain regarding how the strategy will be implemented. For instance, many funding mechanisms in the strategy rely on the province or territory matching funding; if a province is unwilling to contribute, will the Liberals work something out with a municipality? Or will they, in the case of TCHC, allow desperately needed repairs to languish if Kathleen Wynne’s Liberals won’t pony up? Patricia Roset-Zuppa, a senior manager of housing policy at the Crown corporation Canada Mortgage and Housing Corporation, said the feds are confident the provinces and territories will put in money to access funding from the federal government. “This is obviously an existing relationship we’ve had with the provinces and territories for many years,” Roset-Zuppa said of their ability to gauge the interest of the sub-national governments. OCAP’s Acharya is not convinced. And in any case, OCAP has called on the federal government to put a significant amount more money into housing. With the 2017 budget, the government announced it would put $11 billion into affordable housing. On closer inspection, it was revealed that money would be doled out over 11 years, with most of it promised long after the next election. “They’re holding people hostage now [to win re-election] as we lay besieged by a housing crisis, which is largely of their creation, by promise of ever-elusive solutions,” he said. OCAP has called on the government to spend that money between now and the next election, and to build new housing that would be affordable, defined by OCAP as tied to the renter’s income, rather than to the average market rate for rent. An easy way for a government invested in ensuring its citizens have appropriate housing is to provide it. Public housing both allows the government to ensure it is provided to those who need it, at a price they can afford, and decommodifies it—treats housing not as something to be bought and sold for profit, but as a necessity to which people are entitled. In other words, housing as a right. This is the same thinking behind public health care and education: the necessities of life should not be left to the vagaries of the market, where profit-seeking entities can, for example, jack up someone’s rent by hundreds of dollars with little notice. But, while it is preparing legislation to designate housing a right, the federal Liberals are not interested in building more public housing. “When it comes to public housing, we’ve tried to move away from the kind of traditional public housing where there’s very much a concentration of low-income households,” CMHC’s Roset-Zuppa said. The national housing strategy, as unveiled last week, is a rhetorical victory for advocates who can point to specific goals if the Liberals fail to meet them, or demand more ambitious ones. There are questions about whether its promises will come to fruition, given how much of it relies on other levels of government, but it recognizes housing is a right, which optimists might hope will be a first step toward actually guaranteeing the provision of that right for all Canadians.